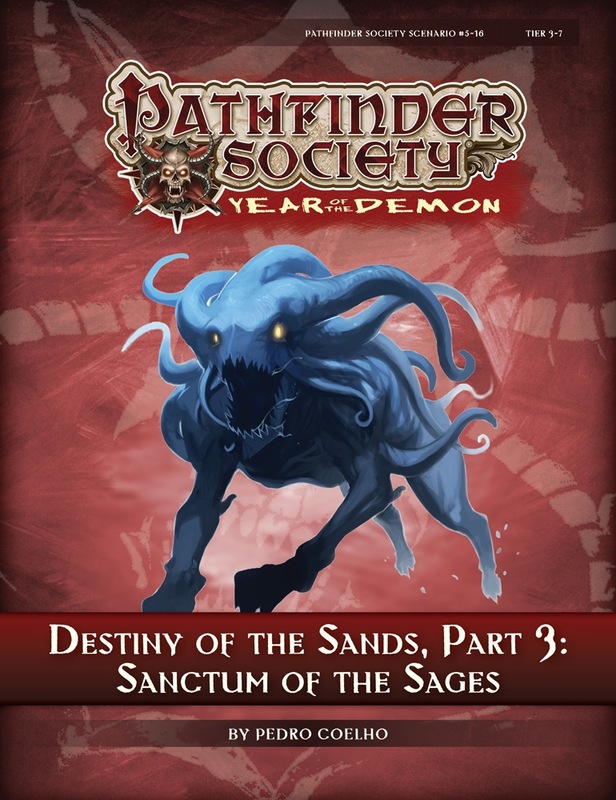 “Sanctum of the Sages” is the final scenario in the three-part Destiny of the Sands campaign arc. It follows Pathfinder Society Scenario #5–12: Destiny of the Sands—Part 1: "A Bitter Bargain" and Pathfinder Society Scenario #5–15: Destiny of the Sands—Part 2: "Race to Seeker’s Folly." All three chapters are intended to be played in order. Story-wise, this is the epic conclusion to the series and a very interesting part of the metaplot. It works up to a long and engaging debate between Amenopheus and the Diamond Sage, where the PCs have the final call to make one of the most impactful decisions of their adventuring career. GMs should be sure to focus on what happens with the Emerald Sage; while this is mostly off-camera it is nevertheless very important to the ongoing plot. Unfortunately, the mechanics for this scenario don't work very well. The inclusion of the mythic rules is questionable and makes combat longer and more complicated for no benefit. While the first two combats are tactically engaging, neither has anything to do with the rest of the scenario; this is followed by a pointless and poorly written chase scene, and a puzzle combat that's basically random trial and error. Finally, a missed opportunity is to have Amenopheus say he will accompany the PCs, only for him to (predictably) go the other way before the first encounter, and teleport in after the last. Regardless of the poor mechanics, don't miss your chance to decide the Destiny of the Sands! I can't say the enemies are weak, but with mystic abilities, my hunter just smash every combat except the final one (cause hard to break thier DR). And I've heard the other two teams go through all encounters as well (my teammates are underpowerd paladin, witch, and pregen cleric). The idea of getting to play a beefed up character of mythic proportion just to finish of a storyline is a unique approach in itself. It gives the players a great sense of accomplishment after the previous two parts and is also more than enough to leave players wanting for more. Luckily this scenario is perfect to fill that void. Fierce opponents, environmental hazards, a chase scene, some role-playing opportunities and a puzzle: this scenario has it all. In order to make the most out of it, you will need a well-balanced party. My party was far from optimal, but we managed to succeed either way. There were times we struggled, but there were also occasions where we had Lady Luck on our side – hello diplomacy roll of 36 without any aid. More importantly though, we had a lot of fun from the start until the finish. If I were to point something out that bothered me a little, I would have to mention the puzzle. In my opinion it’s a nice puzzle, but just too complex and complicated. Without some good rolls or help from the GM, you will find yourself utterly confused as to what to do, while at the same time also having to deal with another problem; a problem you can’t really ignore. Overall I have to say this was a great scenario and a nice conclusion to a great multi-part story-arc. Maybe it was built up quite a lot after part 2, putting this scenario at a disadvantage - I dunno. As a rule of thumb, I'd say if you're playing this and ever feel like you're on the cusp of whether to save those mythic points or use them, go ahead and use them. We played up and ended up saving too many. I was playing my level 4 paladin in high tier, and our classes and levels were very varied across the group (3 to 7, 3 melee fighters, 3 casters). I was really quite terrified to be playing a mythic scenario out-of-tier, and while it wasn't a total cakewalk (there are genuinely scary bits), I really had nothing to worry about. On its own, it'd be a fine scenario. But this is the final chapter in something that is meant to feel epic. And it doesn't - especially now that we're past season 5. Announced for March! Cover image is a mockup. The first PFS scenario written by a Brazilian ! Make us proud Pedro Coelho ! The first two scenarios in this series are for Tier 1-5, but the last is Tier 3-7? Why wasn't the same 1-5 Tier maintained for the final scenario as these are intended to be played sequentially? The choice comes down to a few major factors. Most important of these is the nature of what we're doing in Part 3; as you'll see in about a month, the adventure would not be conducive to Tier 1–5 play, and the characters really need to have a few levels for it to feel right. It's also a sufficiently important scenario that I wanted to make sure a character could not "level out" of playing Part 3 if she were playing the series in order. This also opens up the Osirion storyline to a few more mid-level characters who would not otherwise have an opportunity to participate in their faction's storyline. It's easier to level up a bit than it is to spontaneously lose a few levels to qualify for an adventure. It seems they want to up the difficulty a bit. There are specific thematic elements of this scenario that don't really work for brand new, 1st-level characters. Also, toys that some characters with more investment in the campaign are likely to want to play with. What map products go with this scenario? If answering means spoiling, please ignore this question. I wanted to buy the map and let the GM use it, to save him some dough. I'll let you know when I'm closer to finishing development. It's easier to level up a bit than it is to spontaneously lose a few levels to qualify for an adventure. "... why are you necking with the vampire? THAT DOESN"T WORK!" Hope this isn't delayed, I'm expecting a full table this Saturday. Yeah Matthew, I think we have 5 full tables this weekend at our local con. As for hypothetical delays, I predict none. It's the start of convention crunch time around here, sure, but the editors and I are no less vigilant in our scenario duties. This scenario will be available....."SOON"
Crud... I have that Map Pack, but I've used it a lot, not sure if it's still 'findable'. Wait, I just added it to my cart but still says 'available today'. What gives? Credit card companies love it. They get money per transaction. Vendors don't like it. Usually means it's being uploaded, from my experience. Also, there is no change to how we sell the scenarios. The "Add to Cart" button showing for this product was an error, not a new feature. As a reminder, be sure to use spoiler tags, folks. awww.. keep it! it lets me do all the shopping at once. More for you, less for visa. To correct an error, the Map Pack is Dungeon Sites and not Dungeon Chambers. This looks like a tremendous amount of fun. I thought the chase mechanics were beautifully implemented. And wow that ending. Man that scenario! I'm very excited to run it this weekend! Praises to John Compton, who did a wonderful job developing this scenario into its final form. Thanks, John! Scott and Matt did great jobs, making Parts 1 and 2 tough acts to follow; however, Sanctum of the Sages not only maintains the series's momentum but also cranks up the excitement another notch for an excellent finale. Where would it be preferred that we post parties who had a different approach to the end? The GM discussion is the best place and can be found here. I have started a thread for discussing the scenario's conclusion in the Faction Talk sub-forum. Major scenario SPOILERS are likely to follow in that thread. My compliments Pedro, this is an excellent scenario. I ran it this morning at my FLGS and the players had a great time with it. For those who have played or ran #5–15: Destiny of the Sands—Part 2: Race to Seeker's Folly feel free to read the spoiler. I have Mythic Adventures and the chronicle from part 2 that allows me to apply 3 mythic tiers to my character during part 3. I was planning to spend several hours parsing the best choices for my 4th-level inquisitor, but began to second guess this investment of time. I'm concerned that I'll spend a lot of time making decisions that won't be used, or matter. For those who have built mythic PCs, how have you felt about your time spent and decisions? I just went with the mythic options offered on the boon and I think they should be sufficient. However I know that the people downstairs from us went full on mythic and really enjoyed themselves.